Cinco De Mayo coming up on the "fifth of May" Mexican Strawberry Margarita Blendrita is a great drink for anytime of the year! I love fruity drinks and this one is very refreshing on a hot day! Fill blender 2/3 with ice. Add ingredients and blend until smooth or if you don't prefer this slushy then leave chunks of ice. 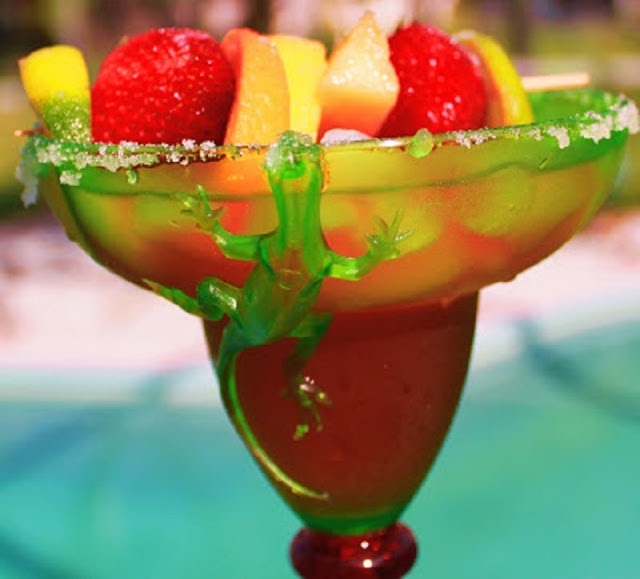 Serve in a glass with a salted or sugared rim and fruit kabob. This one has sugared limes, lemons, strawberries, oranges slices and fresh pineapple chunks. Love the lizard! Refreshing and yummy drink! perfect - but is that enough tequila? This looks perfect for my Happy Hour Friday posts! I could go for one or two of these! We are having an early heat wave! A great drink, I love the lizard on the glass! Happy Cinco de Mayo Claudia! That looks absolutely fantastic - I'd love one right now! I could have a few of these at the end of the day! Love it and the lizard too. Boy does that sound delicious. Mmm...I want a sip!